Wir bieten das MBA Fundamentals Programm speziell für Mitarbeiter aus Research & Development Abteilungen an. Haben Sie Interesse? Kontaktieren Sie stefanie peerYsu8∂kit edu. The MBA Fundamentals Program for doctoral researchers puts you in the position to gain management expertise while still working towards your PhD. Doctoral researchers often benefit from knowledge on management topics at an early stage of their career. Management expertise often has a positive impact on the career possibilities, especially when switching from academia to industry. 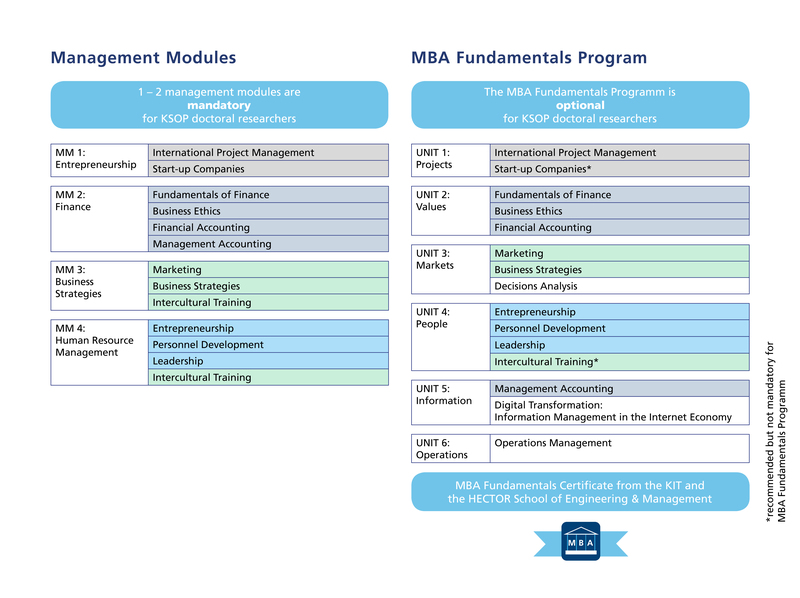 In the six units of the MBA Fundamentals Program you will learn a whole new approach regarding, e.g., project management, human resource management and marketing. As a KSOP doctoral researcher you only need an approval of your PhD supervisor. Costs are covered. **The Intercultural Training is not mandatory for the completion of the certificate and don't grant credits, but participation is strongly advised when completing the full program.